Like many things — the food industry, the medical-pharmaceutical establishment, the mainstream media – the hidden corporate/bankers who control our governments have also standardized the education system through funding. Many years ago in the USA, for example, much money was poured into education by the Rockefeller-created National Education Association, with the help of the Carnegie Foundation and later on the Ford Foundation. The result of the efforts of such organisations can be seen worldwide today in the real purpose of the education system which is to teach children and young people: 1) Reward comes from accurate memory recall from heavy repetition. 2) Non-compliance will be punished. 3) Acceptance that ‘truth’ and what is ‘real’ comes from authority. Thus, the real purpose of the education system is to cultivate conformity and prohibit critical thinking about anything of real importance. Starting at 4 years old (and what could be a better age to start a mass indoctrination? )and finishing by the time an individual comes out of the education system, some 12 years plus on, children have had more than their fair share of programming and brainwashing, and as a result are unable to really think for themselves. Moreover, any genuine outside-of-the-box thinking with significant potential humanitarian or Mother Earth-friendly benefit is ignored, quashed, ridiculed or suppressed by the influence of those hidden controllers if it is perceived as a threat to any of their businesses. 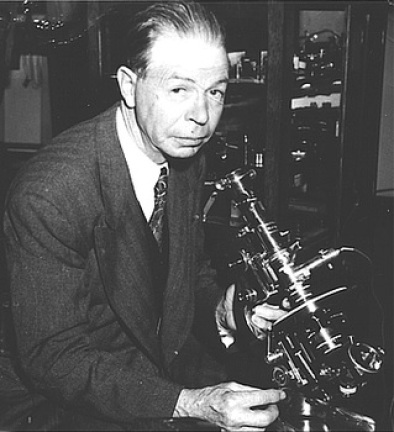 Raymond Rife (1888-1971) and his Universal Microscope for curing cancer. 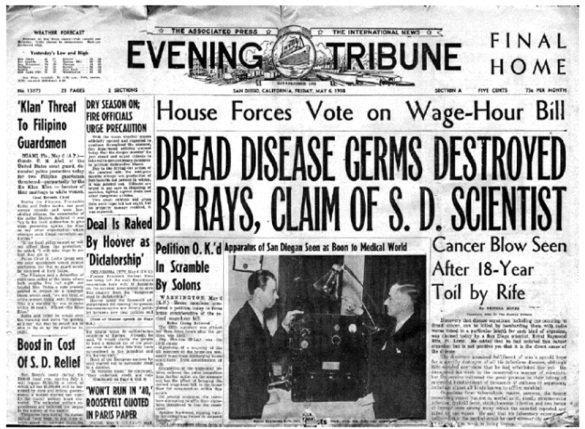 Essentially Rife refused to hand over the rights of his work to the AMA because he saw moneyed interests as hidden ulterior motives – that his the cancer curing machine would not be allowed to the world at large because the AMA and the medical/pharmaceutical establishment did not want patients’ cured. That would mean customers lost and no more revenue for the cancer industry, so instead they push out real cures, and keep coming up with toxic treatments that never cure, instead create further symptoms (side effects) guaranteeing the cancer returns and thus repeat business until the patient eventually dies an unnecessarily harsh death. After years of ensuing court cases with the ‘big boys’ of the cancer establishment, with little money to exist on, Rife exiled in Mexico to avoid imprisonment in the USA. He later died of alcoholism, a brilliant, but defeated man. The pressures of harassment related to the legal battles and constant threat of imprisonment had been too much for him. Pauling had worked with Matthias Rath and they came up with a unified approach to curing heart disease. (1901-1994) – ‘Unified Theory’ cure for heart disease. Essentially, they found that heart disease is the result of a long-term vitamin C deficiency. The solution is to treat patients with frequent high doses (e.g. 6g/day) of vitamin C while using the amino acids lysine and proline to remove the atherosclerotic plaque lining the inner walls of the blood vessels that cause a narrowing or blocking of the lumen (space) of the blood vessels which is responsible for restricting blood flow and cardiovascular disease. However, due to greater interests in corporate profitability and perceived financial threat, this highly successful cheap alternative therapy has not been allowed that much attention. 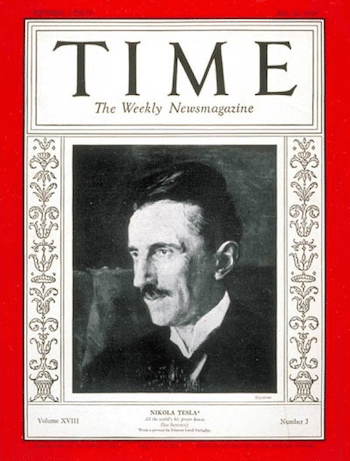 Multi-talented Tesla cut across many disciplinary boundaries. His genius gave rise to a number of world-changing inventions. 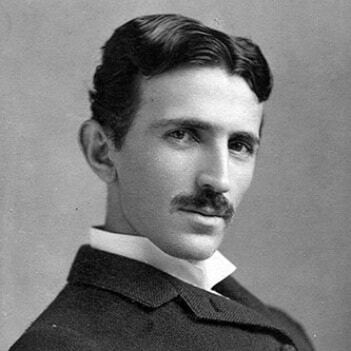 Nikola Tesla (1856-1943) – Wardenclyffe Tower Project free energy. However, Tesla’s funding was stopped. His equipment and lab was burned down together with the related intellectual property because it posed a threat to undercutting the cost of the conventional electricity grid system. If Tesla’s Wardenclyffe Tower Project had been allowed to flourish and not be destroyed then today we could well be living in a utopia. Tesla died a poverty-stricken lonely and forgotten man in New York City. 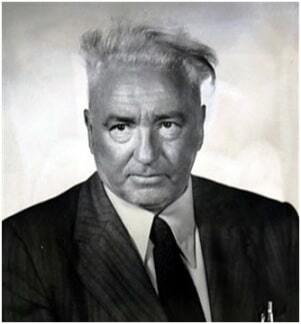 Wilhelm Reich (1897-1957) – Drought-breaking weather control. Wilhelm Reich built an instrument he called the cloudbuster which successfully induced weather change. It has been used to break many droughts by producing clouds that make rain. This workable mechanism for making rainclouds for crop irrigation in drought areas was stopped by those ever watchful lackeys for the ruling elite. Consequentially Reich was hounded by the likes of the FDA (Food and Drug Administration) having accused him of fraud and deception with his cloudbuster instrument. His equipment was seized and destroyed. His last days were spent in prison where it was claimed that he died of a heart attack. I bet you never studied these ‘taboo subjects’ in your formal education training! Why? Essentially, the corporate based education system with its carefully selected curricula covertly serves to impede or stultify real human growth. The corporate funded education establishment just wants you to fit into the system. This is totally consistent with the Pink Floyd song ‘All in all, you’re just another brick in the wall.’ Those individuals most programmed and brainwashed by the education system are likely to be more successful than others. Take for example, at job interviews. Having a greater ‘corporate mindset’ is more likely to get a person a job than others: This ‘mindset’ resonates with interviewers of similar disposition. You are just a resource. On the subject of corporations, too-big-for-their-boots-corporations are soulless greed machines with all the hallmarks of psychopathy. Don’t be deceived by the effrontery, they care very little about the planet and the people on it. Coldly, to the corporations an employee is just a resource, no more than a piece of office equipment, equally expendable, hence the department human ‘resources’. To the corporations, making ‘enough’ money doesn’t exist in their vocabulary. There is no enough. So how can it possibly exist when it’s not in their thoughts? There is so much poverty in the world, with more than a billion people having to live on the equivalent of a dollar or less per day. Roughly every 5 to 7 seconds a child dies of hunger. We are living in a corporatocracy; a corporate run and controlled world. Given that the Presidents, Prime Ministers, and senior politicians are not in power to serve the people, but they are ultimately placed in positions of power to do the deeds of the corporate agenda, then it fully stands to reason that the education authorities serve to follow corporate directives for this very same purpose. Carefully monitored by the controllers over the years, academic institutions have taught science with some major assumptions. These assumptions are now, more than ever, the subject of challenges that question their validity. However anyone in academia who dares to seriously challenge the official indoctrination walks too far away from the white line laid down by the authorities, poses a major threat to the establishment’s iron-clad beliefs, and is likely to find themselves getting shown the door. Indeed, this has happened before. Darwin’s Theory of evolution as an explanation for the origin of life. Human civilization is around 5000 years old. Louis Pasteur and the Disease Theory. In classical physics it is said that consciousness is separate from our physical world. The space between things is just emptiness.All false! Click on the above list to see more info.But you must not challenge! All creditable challenges to the above 5 false understandings receive little attention in academia or mainstream media. This kind of filtering, whether it’s in science; not giving the whole picture, or with any other subject, is done deliberately as part of a plan by the controllers to keep us in ignorance, misinformed and in a ‘no growth’ situation.The higher up in academia, the more specialised and therefore more blinkered a person becomes. These individuals may be unaware of the full picture and ignorant of the facts that contradict the official established line. Unfortunately, these people such as the old fart professors, instead of having an open mind and willingness to see beyond their limited beliefs – their indoctrination – tend to arrogantly defend themselves and ride roughshod on those who dare to challenge. But challenge we must! There are solutions, so never stop questioning! There are such things as free energy and successful cures for all sorts of diseases. They have been about for many, many years. Now the ball is in your court. Don’t take my word on anything I’ve written above, instead, apply critical thinking and start questioning everything! Paul A. Philips is an author and the editor of NewParadigm.ws. April 11, 2019 in MIND GAMES: Propaganda, Psychotropics & Mind Control. AMERIKA: College Was Once Free and For the Public Good—What Happened?